I should have done this giveaway months ago, but you know how March wasn't the best month in the history of my life which totally jacked up April, and well it was almost mid-May before I really started to feel like me again. So here we are, almost June and I'm finally getting around to tell you about Hector and the Secrets of Love and to see if anyone would like a copy because I've got three copies to giveaway. 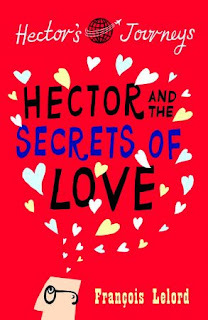 Written by François Lelord, Hector and the Secrets of Love is the follow up to Hector and the Search for Happiness. Hector is a young psychiatrist who sets off to track down a rogue scientist who has fled a pharmaceutical company with their love potion. Naturally, Hector has a few adventures along the way and stumbles upon a bit of love himself (no potion required). It was a sweet, lovey-dovey, easy read with enough doses of real-life relationship drama to keep it grounded and my eye-rolling at bay (I'm an eye roller... give me a sappy scene and my eyes look straight to heaven, and that may or may not be followed by a finger jabbed into the mouth tongue stuck out kind of look... I'm very mature, I know). In short, it's perfect for these summer days; a little sun, and a little Hector, and you're all set. There are four chances to win... 1. If you'd like to enter the giveaway, leave a comment telling me your favorite summertime book and you'll have one entry (and I'll have a book to add to my ever growing amazon basket). 2. For an additional entry, follow my blog and leave another comment letting me know that you do. 3. If you'd like another chance at Hector, 'like' me on Facebook, and leave a comment. 4. And, if you really really want to win, follow me on Twitter (but be sure to let me know, in a comment). Giveaway closes Thursday, 2nd June. Last summer I flew through the Girl with the Dragon Tattoo series while sitting on the beach...great books for lounging! Funny .. I was just coming to see you and then you pop up and comment on mine. Weird with a capital A (too much chocolate for me today). I didn't know you were an eye roller. My sister is an eye roller. So much so that I nearly called the doctor as her eyes were rolling so bad I thought she had a condition. Turns out she is just being nasty. I bet you are not nasty with your eye rolling??!!! My new favorite book (which I think would be fine to read in the summer or any other season for that matter) is The Particular Sadness of Lemon Cake. And of course I like you on facebook. Cool giveaway! Last summer I read "the girls" by lori lansens - it's about a set of craniopagus twins and I thought the concept sounded too weird. but i ended up loving it - such a sweet story! Also, I follow you on twitter, and as soon as my FB works i'll "like you"! Bisous ! Last year I read The Girl with the Dragon Tatoo series. Love this kind of books. Aaaand I like you an FB! Last Night in Twisted River, John Irving's most recent. A little long, but in my list of fave's along with all his other books! Plus, I'm a follower. With a bunch of new books to read! I read the first book so this would be a great follow up. I remember reading a Cecelia Ahern book last summer. Pretty much anything chick lit is a good summer read. I don't have just one favorite summer book, can I still enter the give-away. But I think this summer, I'll read the last/latest Jean Auel book. And then there's Mosquito by Roma Tearne....beautifully written, more not so common history, love and danger. Oh you must read " Blood, Bones And Butter" by Gabrielle Hamilton. And you know I follow you here, I like you on FB, but I don't twitter. Outside of that my credentials are impeccable. Major Pettigrews last stand by Helen Simonson just wonderful summer reading (and winter) and of course the Bruno chief of Police series. I so need light, light fluff reading at present, sorry I am a follower but don't twitter and rarely Facebook. Hi there! Sorry I haven't been visiting lately -- not just your blog, I promise! As for favorite summer book, I guess I'd have to say something by Anita Shreve -- always a good, fast pageturning read. The Weight of Water or Sea Glass are good for summer. My fav at the moment is midnight cactus by Bella Pollen! Its the scariest book i've read and i'm loving it! My favorite summer read was Marley & Me (which I read before the movie was even a dream)... and I absolutely LOVED it! And I'm a follower ~ of course! Well, I once read the entire Twilight series over a few summer days. Judge me, I know. *For an actual intellectual read, try Middlesex by Jeffrey Eugenides. It's incredible. Oh hey, I follow you. Obvi. And I follow you on Twitter. Aaaand I like you on Facebook. I'm starting to look a little creepy. Count me in on this great giveaway missy! I'm a follower here and on twitter... obvs! I like something fun for summer reading. Try "Saving CeCe Honeycutt" it's like a mix between "the help" and "steel Magnolias" but less sappy. I don't really think of books in terms of seasons, buuuuut have you read Cloud Atlas? Because it's really good. This book sounds totally perfect for me. Sappy things make me puke, too. One of my favorite authors of all time is Jen Lancaster, so I recommend anything and everything written by her. Her memoirs are so funny that I seriously want to pee my pants. I am, of course, following your blog on Google! I am also following you on Twitter. so now, for my favorite summer book/book of all time? the magus, by john fowles. Ooh great giveaway!!! My favourite summertime book is either 'Extremely Loud and Incredibly Close' or 'The Messenger'. The second one is crazy uplifting :) Also I follow you!! Oh I am absolutely in loveee with "The Help" by Kathryn Stockett. I listened to it on Audible (have you tried that? I'm addicted) and just really enjoyed the whole thing. I can't wait for the movie! It looks like it took a giveaway for me to finally comment on your blog! As for a favourite summertime read... hmm hmm... I recently devoured David Lebovitz's new book, "The Sweet Life in Paris". So good! Bon-weekend to you & greetings from Annecy! Just became a follower. Whee! And finally, I follow you on twitter! I found you through ...Australia! I have a similar life story only it led me to Norway. You have a beautiful blog and I will love to enter your giveaway. I'm glad that you're back in the swing of things! I hope everything went okay on your trip back to the states. I'm jealous that you're in France again. As for your competition, I believe that I am a follower on Facebook, Twitter, Blogger, and if I lived near you, I'd probably follow you around there, also! As for my favorite summer reading, so far, it has been Committed, the new book by Elizabeth Gilbert. Sounds like a cute story! My favorite genre of books is crime fiction and mysteries but I have read a few really good books that fit the generally accepted "summer read" category. Love Walked In by Marisa de los Santos was amazing and so was Summer Sisters by Judy Blume. Happy reading! There is this really cheesy book: Sushi for Beginners which I quite not so secretly enjoy and also Serendipity (I think that's the name of it). Which is mostly ridiculous, but I like it for brainless reading. I'm following you on facebook! And I'm also following you on twitter! Just found your blog after following you on twitter. Excited to read about your life in Provence. I lived in Nice for one year during university and did a high school exchange to Hyeres, so I absolutely love the South of France and hope to live there again someday, or at the very least visit again soon. My favourite summer read is EVERYTHING I can get my hands on because I finally have time to read during the summer. I just bought a kindle and can't wait to get lots of e-books to read while I travel this summer - one of my favourites is Canadian author Margaret Atwood. I love The Awakening by Kate Chopin. It's so beautifully written, and full of heroism, sadness and modernity that has continued to amaze me for the past decade. It hooked me up! I'm following you!